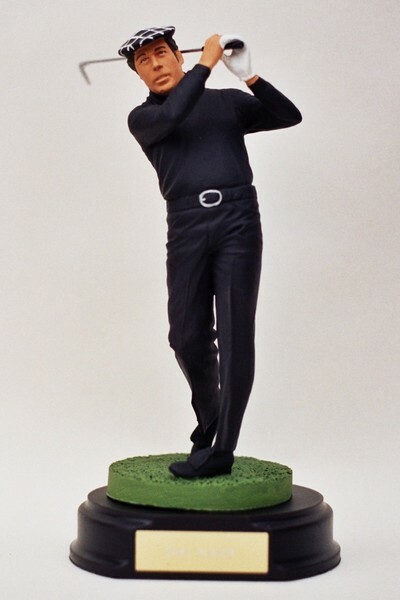 A superb figurine of golfing legend, Gary Player. Gary Player is a South African professional golfer widely considered one of the greatest golfers ever. Over his career, Player accumulated nine major championships on the regular tour and six Champions Tour major championship victories, as well as three Senior British Open Championships on the European Senior Tour. At the age of 29, Player won the 1965 U.S. Open and became the only non-American to win all four majors, known as the career Grand Slam. Player became only the third golfer in history to win the Career Grand Slam, following Ben Hogan and Gene Sarazen, and only Jack Nicklaus and Tiger Woods have performed the feat since. Player has won 165 tournaments on six continents over six decades and was inducted into the World Golf Hall of Fame in 1974.